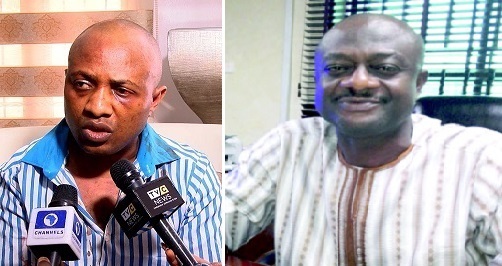 One of the victims of Notorious Kidnapper, Evans who paid about $1.2 million to regain hisfreedom has narrated his ordeal in the hands of the kidnapper. Vanguard reports. On September, 2015, as I was coming back from my factory in Agbara to my home in Festac, arriving Seventh Avenue, I saw four gun men. They stopped in front of my vehicle and started shooting while I was with my two drivers in my Hilux pickup. I was sitting at the back, thinking they were policemen. I was wondering why they were shooting and charging at us not knowing that they were kidnappers. In the process, they shot us, me and two of my drivers but luckily, nobody died. I still have a bullet in my body. By the time I realized they were kidnappers, they dragged me out of my vehicle to their own Lexus 470 Jeep. Inside their Jeep, there were lots of arms and ammunition inside a box. They had another box at the back where they put me in. Four guys were inside that Jeep, well-armed, even the driver had his own AK-47 riffle. They drove past Festac Link Bridge to Amowu-Odofin, around 4:30pm as if they were going to Okota. Later, they came out to Oshodi -Apapa Expressway. By this time, they had not blindfolded me but they pushed my head down, lying bare on the floor of the car. One of them just held me as I was seriously bleeding. I never knew I would survive this. I couldn’t remember the places they took me to because I was lying down. After a long journey, they stopped at a particular area, those guys jumped down and another group came on board and zoomed off again. As we were going, we got to one house, they called the security guard who came and opened the gate, and they brought me out, gathered water, changed their cloths and called one doctor, whether he was quack or not, I do not know. They told the doctor they had emergency. The doctor came, washed me and treated my wound. That was the first thing they did. Though, when we were about to get to where they wanted to take me to, they blind folded me. They were administering two injections on me daily. When I asked them the kind of injection they were giving me, they said it was anti tetanus injection and pain reliever. They refused to give me water saying that if you have bullet in your body, you don’t drink water. The second day, Evans came there with the doctor and said to me that, he came there because of me. Yet, I did not set my eyes on him. Maybe, the person that asked them to kidnap me told them that they should not let me die. I said this because of the kind of treatment they were giving me or maybe, it could be because of my wound. But, I was seriously bleeding. At a point, they were thinking of exchanging me. They called my brother to come and let me go out and treat myself of the bullet wound. My elder brother accepted to come but backed out at the end because those people, you never know what they planned. May be their plan was to capture the two of us before they would kill us. It was an ugly situation. They injected me for seven good days. From that Monday till the next Sunday, every two days, there was a particular guy that came there to treat my wounds, dress it and put the bandage again. After some days, Evans called. How they operate is that, they keep a hostage keeper, which is someone that would be guiding kidnap victims so that any time their boss wants to call, he would call that person. When he calls the person, the person would bring the phone to the victim and hold the phone for you talk to him. They were always communicating. They did not maltreat me because of my condition but I heard them maltreating the victim in the other room with hot iron and the person would be crying. Before they start that, they would go and put on their generator so that their neighbours would not be hearing. That guy was a terror. They were feeding me with one useless Indomie. I was just managing to eat to keep my life moving. They asked what kind of drugs I was taking but I told them I was not on drugs. I did not make trouble with them but there was a day I tried to escape. I was scared whether all the neighbours were their gang members or not. Again, even if I would have escaped, I would have been naked because before you go to the bathroom, they take away your boxers. When you finished, you knocked at the door and turned your face to the wall as they gave you your boxer to wear. They would blind fold you and put you in chains again. Early morning I used to hear siren and I thought, that it was police that were coming to rescue me. At the end nothing would happen. They would go. What were they coming to do there around 4:00 am to 5:00 am? I noticed that five times and I asked myself, “what the police are coming there to do?”. I also noticed there was a construction site nearby where people were working. One particular day, one boy came in and asked “mummy, who is this uncle?”. I was listening and waited to hear what the woman would say but she did not say anything. So, that couple that was paraded were there. I was praying every minute of the day, waiting for anything that would happen the next day. It was traumatising . So many things happened. I knew that, nothing would happen to me but they would charge me more money. You know, I paid $1.2 million. We paid it in three instalments. We paid two hundred thousand dollars, eight hundred thousand dollars and another two hundred thousand dollars. He claimed that, the first two hundred dollars we paid had been cancelled because we set them up by inviting security agents to be tracking them. That’s how we were accused and that the payment had been rubbished. He bargains with the victims, he doesn’t bargain with the families. Whatever he asked for that is what the family would pay. A person that is under chain, what would he say? Anything they asked you to do, you just had to do it because of your life. That was not joke, they meant business. If you refused to co-operate, they would kill you. I am sure; they have killed some people there. I stayed there for six weeks. I was abducted on the 7th of September and I was released on the 19th of October, 2015. What led to my release? After I had finished paying the ransom, they still kept me for another eight days. My people were worried, and I was worried too because I did not know what was going on outside. They had cut off communication with everybody. Immediately, he collected his ransom, he travelled abroad. He goes outside to keep his ill-gotten wealth, which was obvious. I now asked the hostage keeper, how long it takes them to release a hostage. He said four days, I now asked again, but why am I still here? He then said I should not worry, that the chairman travelled and that I would be released as soon as he returned. He said that I should see myself as a free man and relax. The man was a greedy man. Of all the money we paid him, he didn’t feed us well. His duty, I observed, was to collect money and drop victims. When he came back to Nigeria, he came to me where I was detained by his men and said to me that, today, you will go. He ordered his boys to bring all my belongings. My Rolex watch, my bag, my golden ring and my sandals were nowhere to be found. Not to talk of cash because all of them were criminals. All other valuables were gone. They only brought my cloths, bank cheque books and seals and a polythene bag. And for my sandals, they bought one bathroom slippers for me. Just imagine someone coming back from his office. Then, he asked me to hold on till the road was free; it was about 5:00 pm. As I was waiting, he came back and called me, Nnwa which is my title name. Any time he wanted to talk to me he first called me Nnwa. When he saw my wound, he said, I was a lucky man. That, my God is a great God. He said that, I would live up to hundred years for surviving that gunshot. I asked him why they were shooting us like that. He said in war all was fair. I then asked “you and who were fighting?. Did I have gun with me?”. Evans now asked who was the person in front of my car. That was when they thought I was a policeman. In fact they would have killed my driver if he were a policeman. When he came down and they asked him, he told them he was just an ordinary driver. That was when they left him. “Any day you are going to do thanksgiving, we are going to be there.” I now asked him, how would I know you will be there? He replied that, I shouldn’t worry; he would come and follow me to thank God. “Nnwa, but your God is great oh”. All these things he was talking, my mind was not there because I knew he was wicked. That evening, he brought ten thousand naira that I should take it. That if, they drop me anywhere, I should use it to enter taxi to my house. Or if I wanted, they could drop me in a nearby hotel so that, I could call my people to come and carry me. But I told him to just drop my anywhere he wanted. When it became dark everywhere, they took me out of that house and moved me round the city before finally dropping me around Lagos State University (LASU, side in Iyana Oba. Even to walk was a problem because, I had been in chains for long and all my bones had grown weak. I almost fell down while trying to cross the road because of my wobbling legs. I lost so much energy that, I became weak, lean and tired. Suya was the first thing I ate after my release from captivity. I called a motorcyclist to take me to any nearby bus stop, which he did. When I turned the other side, I saw one man selling roasted meat (Suya), I went to him and bought the meat for one thousand naira and started eating. My action was to soften the ground for me to start asking question that would let me know exactly where I was as by this time I never knew where I was exactly. I asked the man, how I could get to Mile 2, and he said before you get to Mile 2, you first of all get to LASU. I asked again, how I could I get to LASU, he told me to cross the road to the other side and enter any bus that was going that way. As soon as I entered the bus, I switched on my phones and there was no single credit on my phones except the one we used as a company group. That one doesn’t need credit because we pay once in a month. I now used it to call one of my managers. Immediately he saw my call, he knew I was out and asked me where I was so that he could come and carry me. I told him to come to LASU, I got there and was waiting for him. He was coming from Agbara axis. While there, I strolled down a bit to buy orange, one man just came to me that I should give him money in spite of my tattered appearance. I took two thousand out of the ten thousand Evans gave to me and gave to him. I was kind of hiding so that people who knew me before would not notice me until I got home. When my manager came, he took me straight to the house after that, I went to report officially to the police. Even the commissioner of police came to my house after that. After that incident, I requested for police protection which I was later provided with. I was so happy when I heard that, the guy has been arrested. I thank the Nigeria police for doing a great job. That shows that, if the police want to work, they could work. 0 Response to "“How I Was Kidnapped By Evans Gang” – Victim Narrates Ordeal, Reveals He Paid $1.2m Ransom"